Module for calculating vibrational normal modes for periodic systems using the so-called small displacement method (see e.g. [Alfe]). So far, space-group symmetries are not exploited to reduce the number of atomic displacements that must be calculated and subsequent symmetrization of the force constants. For polar materials the dynamical matrix at the zone center acquires a non-analytical contribution that accounts for the LO-TO splitting. This contribution requires additional functionality to evaluate and is not included in the present implementation. Its implementation in conjunction with the small displacement method is described in [Wang]. Class for calculating phonon modes using the finite displacement method. C    = C      ->   C  (R ) = C  (-R )  . As the force constants can only depend on the difference between the m and n indices, this symmetry is more conveniently expressed as shown on the right hand-side. Initialize with base class args and kwargs. Restore acoustic sumrule on force constants. Zero elements for interatomic distances larger than the cutoff. Calculate phonon dispersion along a path in the Brillouin zone. The dynamical matrix at arbitrary q-vectors is obtained by Fourier transforming the real-space force constants. In case of negative eigenvalues (squared frequency), the corresponding negative frequency is returned. Frequencies and modes are in units of eV and Ang/sqrt(amu), respectively. List of k-point coordinates (in units of the reciprocal lattice vectors) specifying the path in the Brillouin zone for which the dynamical matrix will be calculated. Returns both frequencies and modes when True. Include non-analytic part given by the Born effective charges and the static part of the high-frequency dielectric tensor. This contribution to the force constant accounts for the splitting between the LO and TO branches for q -> 0. Print warnings when imaginary frequncies are detected. Check maximum size of forces in the equilibrium structure. Calculate phonon dos as a function of energy. Shape of Monkhorst-Pack grid for sampling the Brillouin zone. Broadening of Lorentzian line-shape in eV. If indices is not None, the atomic-partial dos for the specified atoms will be calculated. Return matrix of force constants. Read forces from pickle files and calculate force constants. Extra keyword arguments will be passed to read_born_charges. Specify method for evaluating the atomic forces. Symmetrize force constants (see doc string at top) when symmetrize != 0 (default: 3). 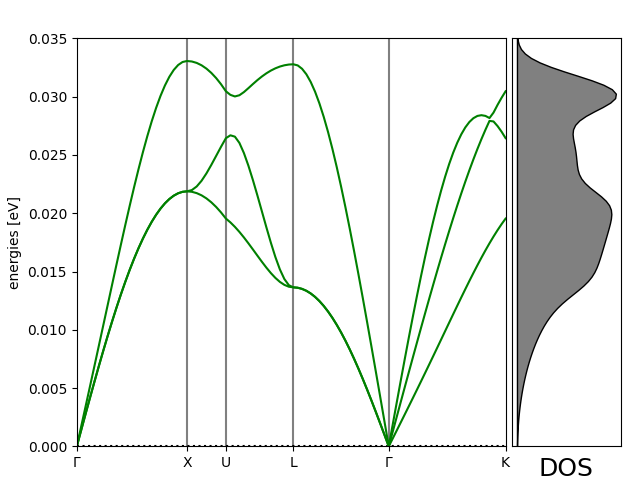 Since restoring the acoustic sum rule breaks the symmetry, the symmetrization must be repeated a few times until the changes a insignificant. The integer gives the number of iterations that will be carried out. Restore the acoustic sum rule on the force constants. Zero elements in the dynamical matrix between atoms with an interatomic distance larger than the cutoff. Read in Born effective charge tensor and high-frequency static dielelctric tensor from file. Read Born charges and dieletric tensor from pickle file. Restore charge neutrality condition on calculated Born effective charges. Write modes to trajectory file. Temperature in units of eV. Determines the amplitude of the atomic displacements in the modes. Include non-analytic contribution to the force constants at q -> 0. Repeat atoms (l, m, n) times in the directions of the lattice vectors. Displacements of atoms in repeated cells carry a Bloch phase factor given by the q-vector and the cell lattice vector R_m. Number of images in an oscillation. Center atoms in unit cell if True (default: False).